Georgia sophomore running back D'Andre Swift heads into this week's home game against Auburn coming off the first two 100-yard games of his college career. He and junior Elijah Holyfield helped lead the Bulldogs to an SEC East title-clinching win at Kentucky last Saturday. Georgia junior running back Elijah Holyfield is the leading rusher for the Bulldogs through their first nine games this season. 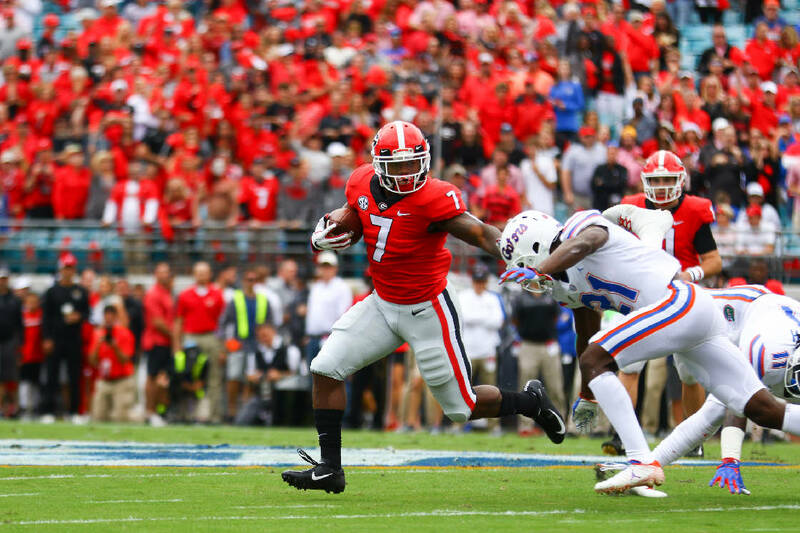 ATHENS, Ga. — Georgia running backs Elijah Holyfield and D'Andre Swift fielded questions throughout the spring and summer about filling the shoes of Nick Chubb and Sony Michel. After combining for 271 rushing yards and three touchdowns during last Saturday's 34-17 clubbing of Kentucky, they were asked about it some more. "I think we're our own 1-2 punch," Swift said. "Sony and Nick left a great legacy, but we're trying to create something new." Holyfield and Swift will never replace the Bulldogs who set the NCAA career rushing mark for a tandem with 8,407 yards. Chubb rushed for 1,345 yards and Michel 1,227 last season, when Georgia won its first Southeastern Conference title in 12 years, before both were snagged among the first 35 selections in April's NFL draft. Yet with Georgia assured of playing at least 14 games this season, Holyfield is on pace to rush for 1,048 yards and Swift 968, continuing the program's recent run of double trouble out of the backfield that included Todd Gurley and Keith Marshall before Chubb and Michel joined the fun. "This was kind of the plan, but stuff didn't happen at first," Holyfield said. "Now we're getting into a groove, and the more carries we get, the more confident we get with each other. I think we're having a pretty good year so far." Georgia's newest ground-game pair got off to a decent but not spectacular start, largely due to Swift battling a groin injury that carried over from the spring. The 5-foot-9, 215-pound sophomore from Philadelphia carried 24 times for 119 yards through the first three games this season but had a career-best 104 yards against Florida on Oct. 27 before shattering that with 16 rushes for 156 yards at Kentucky. Swift averaged 9.3 yards per carry the past two games, wins that catapulted the No. 5 Bulldogs (9-1, 6-1) to a second straight SEC East championship. "I'm dealing with a lot of stuff — my foot, my groin, my hip — but I'm just pushing through it," Swift said. "I'm about 80 or 85 percent right now. It's been hard to do what I want to do, but I'm definitely happy." Swift had an 83-yard touchdown run midway through the third quarter at Kentucky, which he said supplants last December's 64-yard score that sealed the 28-7 win over Auburn in the SEC title game as his new favorite run. Yet it was his 20-yard score late in the second quarter that may be his best run to date, given that he made a pair of inside cuts to juke Wildcats defenders before plowing past two more inside the 5. "The two moves he made on the same play last week were pretty incredible," Bulldogs coach Kirby Smart said. "Those were explosive cuts. When you look for one-cut short quickness, he certainly defines that." Swift has 99 carries for 622 yards (6.3 per carry) and seven touchdowns, while Holyfield has a similar season stat line of 103 rushes for 674 yards (6.5) and five scores. A 5-11, 215-pound junior from the Atlanta suburb of College Park, Holyfield rushed for 100 yards on eight first-half carries during the 49-7 pummelling of Middle Tennessee State on Sept. 15. Holyfield set his collegiate career high last weekend with 115 yards on 18 rushes. With Chubb and Michel arriving in 2014 as top-50 national prospects, they formed a bond that strengthened during their four years together. Holyfield and Swift are separated by a year but are enjoying each other's success, which has been growing by the weekend. "I get to see what he's doing and see how it works against a defense, and then I can go in and do what I do," Holyfield said. "I think we complement each other really well. We were good friends before, and now we're both at the stage where we're feeling the game a little bit easier. We're both peaking at the right time." Said Smart: "I don't think there is a whole lot of difference in their styles. I know one is a slasher and one is a bruiser, but they're both really good vision backs who run hard. The best thing they do is protect the ball." According to CBS, offenses have thrown at Georgia senior cornerback Deandre Baker on just 12 percent of their passing plays this season, and only 6 percent resulted in completions. Pro Football Focus reports the opposing passer rating when targeting Baker is 31.3. Georgia sophomore Jake Fromm is among the 16 semifinalists for the 2018 Davey O'Brien National Quarterback Award.